It is going to rain tomorrow. If you are tailgating with us, if you have any sort of tent or covering you can bring please do! We will be doing the tailgate rain or shine but if the rain is really bad we might park in a near by parking garage. Also remember we will have some food and and some booze but we are looking at probably 100 people for this thing assuming the weather isn’t horrible so we need everyone to bring your own food and booze if you can. If anyone has a grill or any of the normal tailgating stuff bring it. We can’t have too much stuff. One thing we will have at the tailgate will be Orange Miami Dolphins Rally towels. We had the Dolphins send us a box of 50 towels that they were giving out at the last Jets game. We will be giving them out to anyone who bought tickets with us and hopefully we can fly those Orange towels all day. 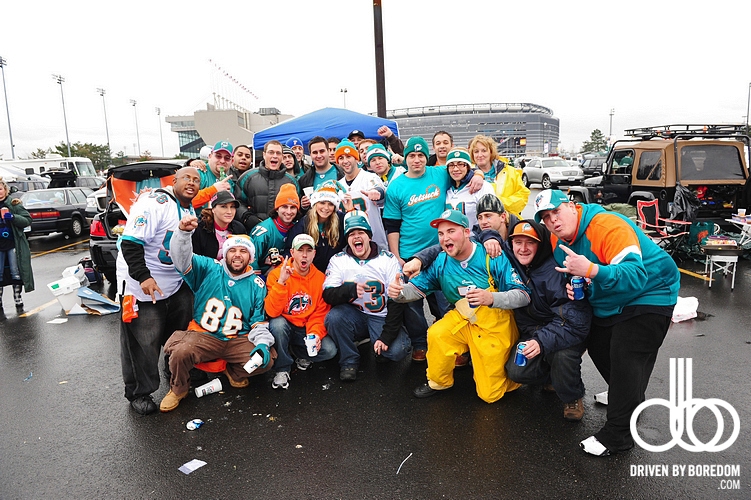 If you are planning on tailgating with us and have not done so already email DolfansNYC@Gmail.com with your contact info. We will be emailing everyone as soon as we park and know where we are going to be. We are planning on being there between 11 and 11:30. If you can’t get email on your phone give us your phone number and we will text you. 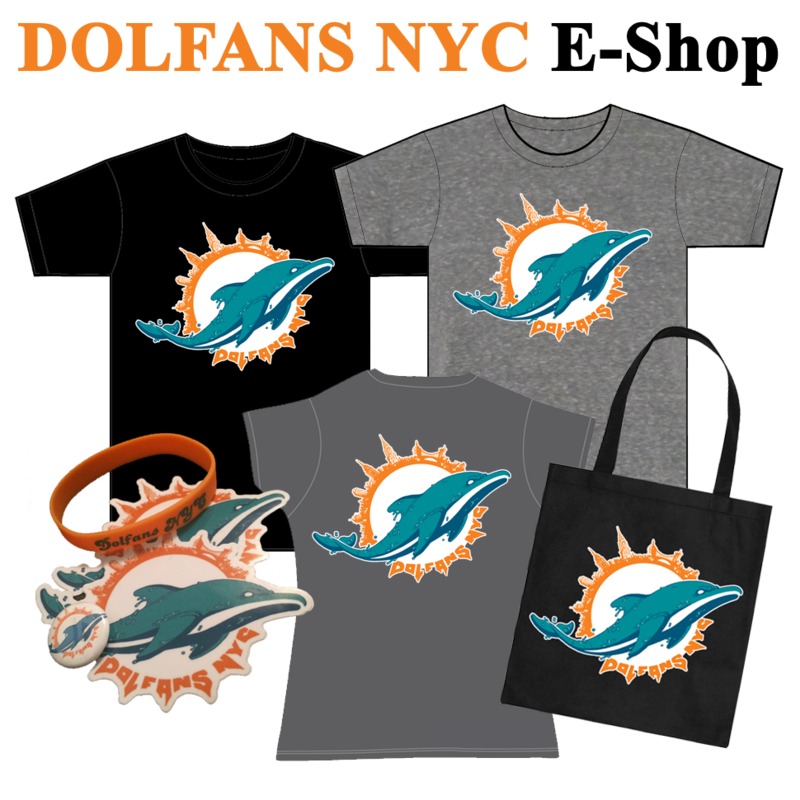 We will also be updating the @dolfansnyc Twitter and updating the Facebook group as soon as we park. Now, very important. 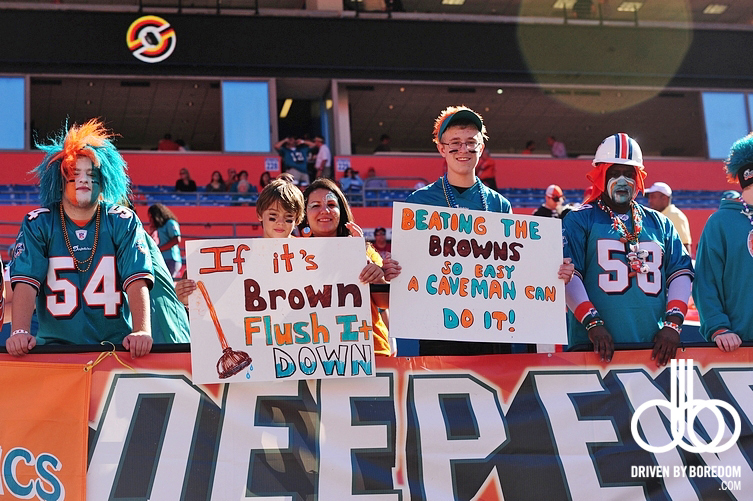 I know with the weather and the Dolphins record some people are trying to get rid of tickets. If you bought your tickets with us you are with a group of Dolphins fans. Do NOT sell your tickets to stub hub or let them fall into Jets fans hands. That would be really unfair to the rest of the group. People bought these not so great 300 level tickets so they could be surrounded by Dolphins fans, people want support in enemy territory. If you have extra tickets please post a message on the Facebook group. If anyone needs tickets, please check the Facebook group. Hopefully we can figure this out. AGAIN… If you need tickets, please check the Facebook group! Someone will be able to help! And finally… I just wanted you guys to check out this song by a Miami rapper named Solo D. He writes a song every week about the Dolphins upcoming opponent. His song about the Jets game is amazing. We have already hit him up about doing an official Dolfans NYC song. Can’t wait until we take over Giants Stadium tomorrow. Go Dolphins! So if you don’t know already Alex, Michelle and I went to “Web Weekend” an event put on by the Miami Dolphins that gets all the people around the world who run Miami Dolphins websites together.Â We get free tickets to the game, we get a sideline pass before the game, we get to meet the coach and we get to do question and answer sessions with others in the Dolphins organization.Â This year we got to talk to coach Sparano, injured draft pick AJ Edds, former Phin Sam Madison and CEO Mike Dee.Â We presented Mike Dee with $1000 dollars that we as a group raised for the Miami Dolphins Foundation. The Dolphins seemed very touched by the Donation so I wanted to thank you guys again for all the support. Thanks for buying t-shirts and raffle tickets and that sort of thing. It helped a lot. Michelle is going to be putting a Web Weekend video together and I have a feeling Alex is going to have something to say about the experience but for now you should take a look at my pictures from the trip. I uploaded them all to my personal website so you are going to have to check it out over there. Go Dolphins! Welcome to another exciting edition of The Faces of DolfansNYC.Â This time we interviewed fan club members at our big tailgate at the Meadowlands.Â One of our members showed up on crutches.Â That is dedication.Â We will be interviewing people every week for this segment so come get interviewed on Sunday for our beat the Patriots DolfansNYC fundraiser at Third and Long.